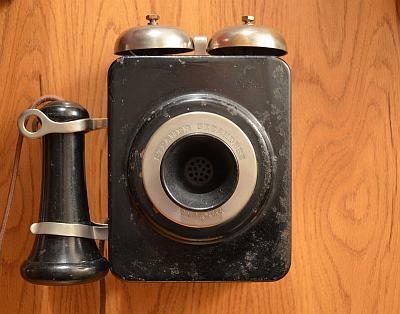 We’ve added a Google Custom Search option to the telephone museum’s website. The Google Custom Search helps our telephone museum’s website visitors find the information they’re looking for. Go to https://cse.google.com/cse/ to create a Google Custom Search for your own site. Google makes it very easy to setup your own Google custom search. Just login to https://cse.google.com/cse/ using your Gmail account and following the instructions. Please note that the free edition of Google CSE comes with ads, you can upgrade to Site Search with optional ads. While working on the cataloging project at the JKL Museum, we discovered a small ships telephone made by Kellogg. The telephone is located in the telephone museum’s section for telephones made for use outside and or in hazardous locations or for the use on ships. This little black telephone is made from sheet metal and fitted with a transmitter marked “STEAMER SEEANDBEE” and “KELLOGG” on the faceplate. The receiver is secured with a nickel plated clamp to prevent it from falling.